Summary: Growing up in rural New Hampshire in the late 1800’s, Mary Titcomb yearned for an education and a career. She didn’t want to be a nurse or a teacher, but was intrigued when she read about the new field of librarianship. She worked in libraries in Concord, Massachusetts and Rutland, Vermont before eventually becoming the director of the Washington County library in Maryland. A county library was unusual at the time, and Mary had to figure out how to reach the 25,000 people scattered across the 500 square miles of Washington County. She decided to have a horse-drawn wagon built that could carry books to these remote locations, and the first bookmobile was born. 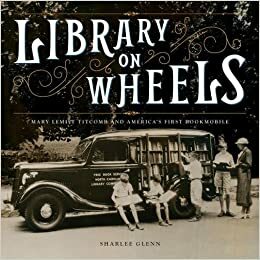 The wagon eventually was replaced by a motorized vehicle, and Miss Titcomb’s tireless efforts to publicize her work spread bookmobiles across America. Includes an author’s note that tells how she found Mary Titcomb’s grave in Concord’s Sleepy Hollow Cemetery and raised money for a headstone; also an extensive bibliography. 56 pages; grades 3-7. Pros: This square book resembles a scrapbook, with a large font, and photos and other memorabilia decorating the pages. It’s a lively introduction to a woman who believed in the power of libraries to enrich all citizens’ lives and worked hard to bring her vision to life. Cons: The subject may be of greater interest to librarians than to their patrons.